As long as I can remember, I have been a collector of things. PEZ dispenses, action figures, comic books, DVDs, and probably some other things I have forgotten about by now. 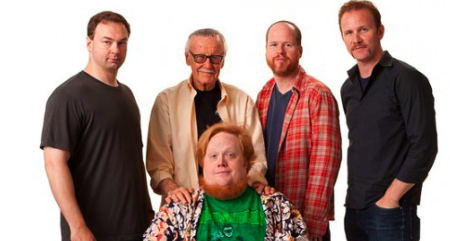 With that said, I can definitely identify with and understand why the people in the new Morgan Spurlock documentary “Comic-Con Episode IV: A Fan’s Hope” do what they do. San Diego Comic-Con is considered to be the Geek Mecca of modern times. For four days every year, an estimated 125,000 people head to San Diego to buy and sell comic books, DVDs, and action figures, meet celebrities and artists, and attend panels featuring Hollywood’s biggest celebrities. What started with a few hundred people in the early 1970s has grown into one of the biggest marketing platforms for comic book publishers and movie studios alike. Notably absent from the film is Spurlock himself. In his previous three documentaries he was front-and-center, on camera and providing narration – neither of which he does here. There also doesn’t seem to be a hint of sarcasm or attempts at raising any questions about an issue. In “Super Size Me” it was about obesity, in “Where In the World is Osama Bin Laden” it was about the middle east; in “The Greatest Movie Ever Sold” it was about product placement and advertising in movies and television. In those movies, Spurlock would charm his way into meetings and point out the hypocrisy of what corporations were doing through humor. “Comic-Con Episode IV” doesn’t really have anything to explain or explore aside from showing some people who like movies and comic books, and that is ok.
As someone who has been to many comic book conventions, there really was nothing new for me to get out of this. I appreciate how sweetly it treats the subjects because it would be very easy to make a movie mocking these types of people, but there just isn’t anything here that is especially new or compelling. Someone who already is familiar with this world will see and hear things they already know, and outsiders will probably just have their opinions reinforced – that Comic-Con is where creepy grown men dress up as Storm Troopers and ogle at models paid to cruise the convention floor in a Slave Leia metal bikini and pose for photos. One of the characters, “The Collector,” is going to the Con with the solo purpose of buying an exclusive 18-inch Galactus figure from Hasbro. When he’s interviewed in his office (a room wallpapered floor to ceiling with mint in-box Marvel action figures) he mentions that his wife just doesn’t understand what he’s doing. Instead of talking to the wife, or anyone not in the know for that matter, we just continue to see him talking about how valuable some of his toys are. I also found a lot of the movie’s main stories seemed focused on people trying to make money or get noticed at the convention. Two of the plot focuses are artists showing their drawing portfolios to try and get jobs working for Marvel. One is a comics dealer, worrying about making his sales quota. 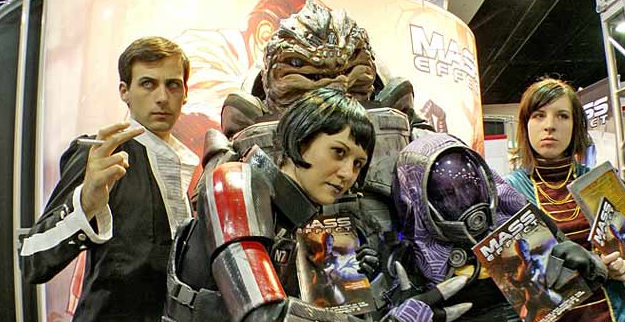 Another is a woman who makes costumes based on characters from the video game “Mass Effect” in hopes of getting a job in the Film/TV industry. For a movie subtitled “A Fan’s Hope,” there doesn’t seem to be a ton of fandom on display – just a lot of people trying to get careers going. It is clear that Spurlock an his cavalcade of celebrity cameos (from Con regulars like Kevin Smith and Joss Whedon, to horror director Eli Roth and Olivia Qilde) are fans, and I did enjoy how sincere the movie was. Instead of poking fun at these people, it celebrates them and the joy of going to a place full of people who share your interests (which others may look down upon). The movie moves quickly and is light and enjoyable, but like Spurlock’s other documentaries, refuses to really engage in anything beyond “Isn’t this fun? !” Fans will appreciate being represented in a movie, but wont hear anything new – and outsiders still won’t get it. Again enjoyed the commentary . Liked the style and structure . Keep up the good work . Looking forward to more! !